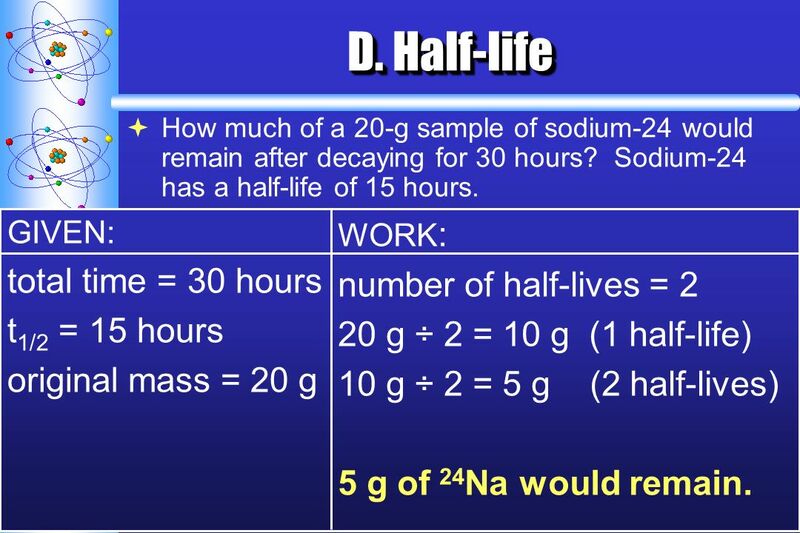 7 D. Half-life How much of a 20-g sample of sodium-24 would remain after decaying for 30 hours? 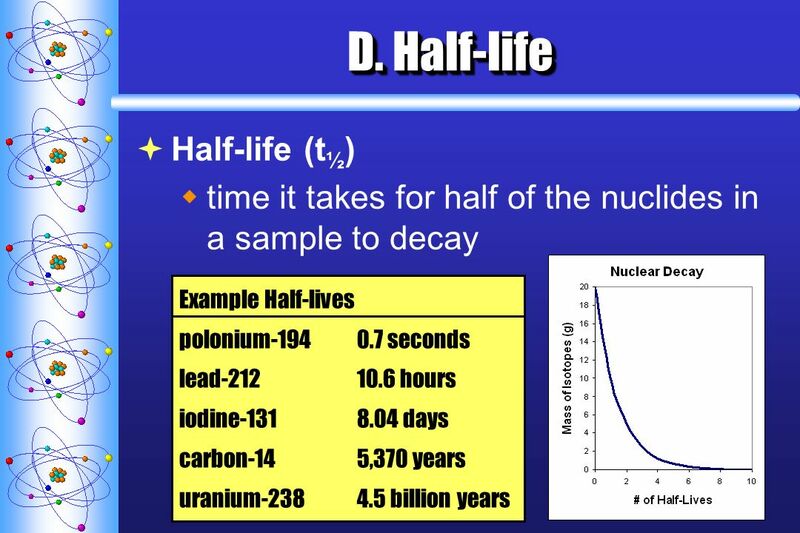 Sodium-24 has a half-life of 15 hours. GIVEN: total time = 30 hours t 1/2 = 15 hours original mass = 20 g WORK : number of half-lives = 2 20 g ÷ 2 = 10 g (1 half-life) 10 g ÷ 2 = 5 g (2 half-lives) 5 g of 24 Na would remain. 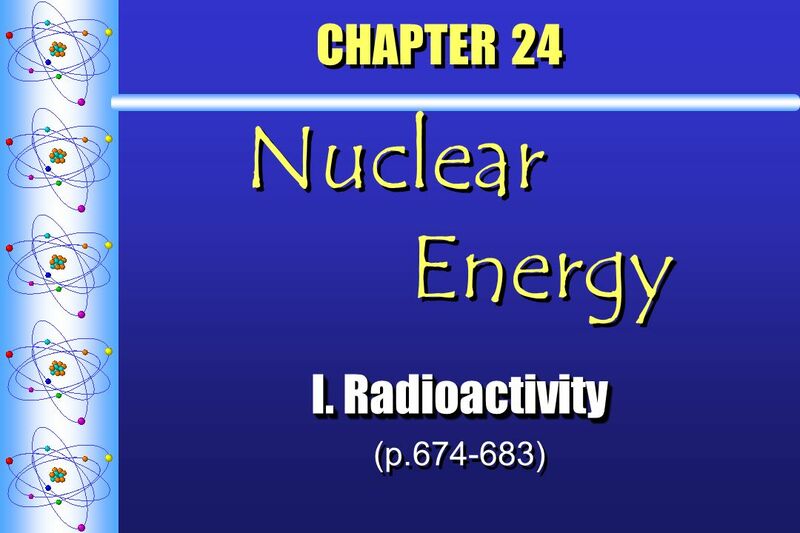 Download ppt "CHAPTER 24 Nuclear Energy I. Radioactivity (p.674-683) I. Radioactivity (p.674-683)"
Radioactivity Chapter 6.1. 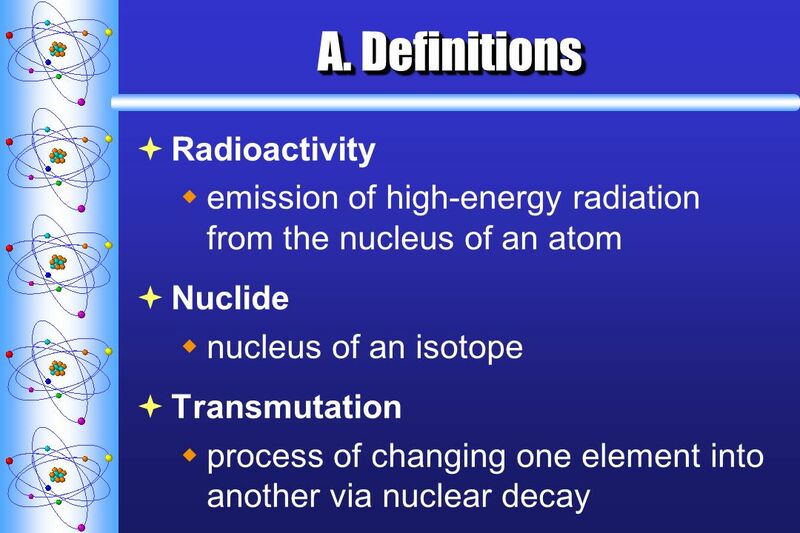 Radioactivity Comes from an unstable nucleus Can be either… Particles or Energy (as electromagnetic radiation) or Both. Nuclear Physics. 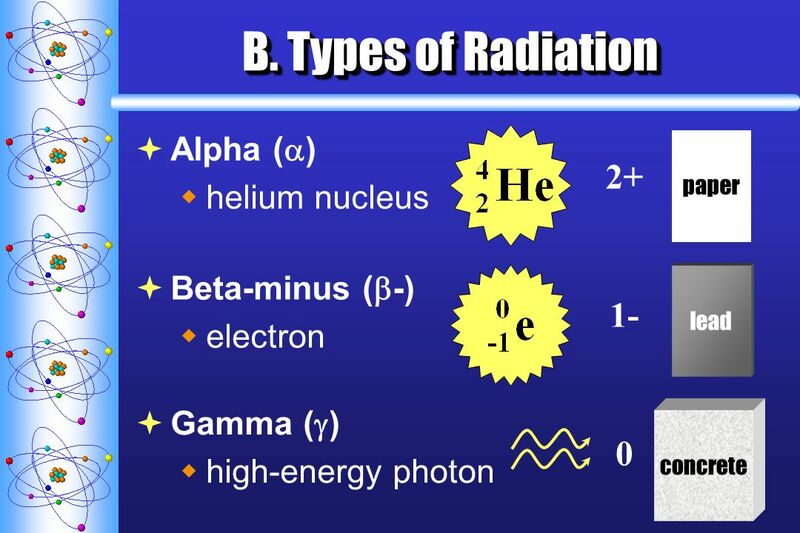 Outcomes What is the difference between alpha, beta and gamma radiation? What are the rules for writing equations of nuclear reactions? Half Lifes. Atoms Proton Electron Cloud Neutron Atomic Number Number of protons – change this → change the element Hydrogen has one proton and one electron. 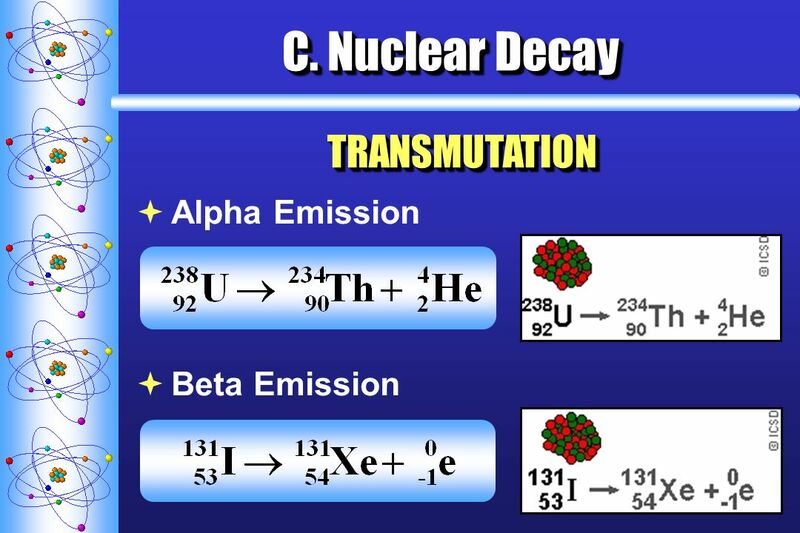 Radioactive Decay Radioactive Decay. 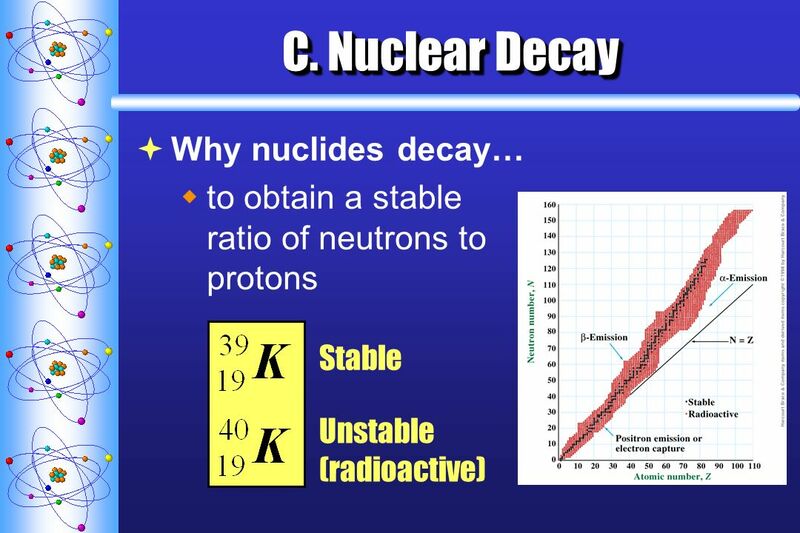 Radioactive Decay: Some unstable atoms try to regain stability by losing energy. They lose energy by emitting radiation. Chapter 18.  Mass # Symbol  Element Name or symbol – Mass #  Parts of a Reaction Reactants  Products. Nuclear Chemistry Chm Chapter 22. The Nucleus Remember that the nucleus is comprised of the two nucleons, protons and neutrons. The number of protons. C. Johannesson CHAPTER 22 Nuclear Chemistry II. Radioactive Decay (p. 705 - 712) II. Radioactive Decay (p. 705 - 712) I IV III II.